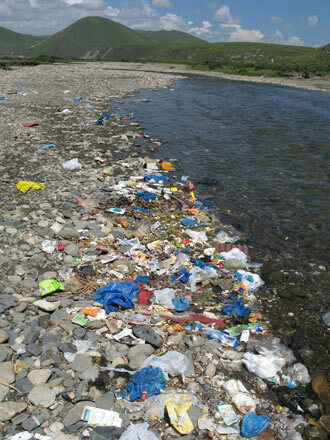 As in many third world countries, trash management in China, and even more so in Tibet, is a huge problem particularly outside the tourist areas where there don’t seem to be any centralized places for disposing of trash. The more organized municipalities have random piles of trash distributed throughout the town while less organized places are evenly littered with garbage – it is just like living on a dump. 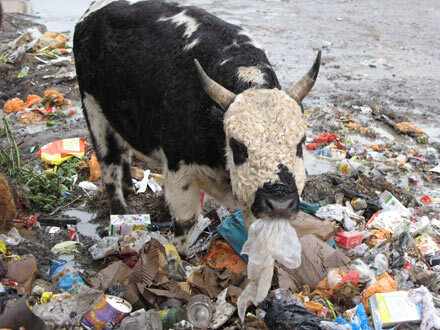 The most shocking examples of trash mismanagement, we encountered in Tibet. Many small settlement do not have any toilets so people relieve themselves by walking a few meters to squat between a herd of sheep and a pack of stray dogs. 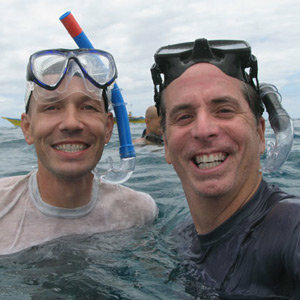 But the worse practice of all is to use the rivers as dump. All the plastic bottles and packaging materials, of which there are an abundance, go straight into the river and get deposited downstream along the riverbeds. This is a major problem and since China is so concerned about making money with occupied Tibet, they had better cause environmental awareness quickly in Tibetans and Chinese alike. Trash Mismanagement is a serious problem in many countries throughout the world and it is long overdue for all of us to address this problem and to figure a way of resolving it, due to the fact that everyone suffers. The land, the air, the water, the animals, and humans all suffer when garbage is not disposed of properly. Also, aren’t we all guilty of making too much trash in the first place. I can remember in the 50’s when I was a child, a weeks worth of trash is equal to what we have in 1 day now due to so many throw away containers, plastic bags, JUNK MAIL, and wasted food etc. I that the world is creating to much trash these day and we have to do some thing about it. I think that some one should go to Tibet and we should get a group of volunteers to help clean up and make a dump site and a sewerage system. We can make a big difference in the world if we do that. We can keep the animals that are getting extinct and help the plants to stay and give us (and the animals) what we need.